Definition at line 164 of file zutil.c. Referenced by deflateInit2_(), inflateBackInit_(), and inflateInit2_(). Definition at line 173 of file zutil.c. Definition at line 28 of file zutil.c. 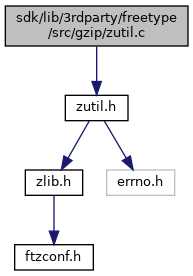 Definition at line 17 of file zutil.c. Referenced by _tr_stored_block(), deflate(), deflate_stored(), deflateCopy(), deflateGetDictionary(), fill_window(), flush_pending(), inflate(), inflate_blocks(), inflate_flush(), inflateBack(), inflateCopy(), inflateGetDictionary(), read_buf(), and updatewindow(). Definition at line 41 of file zutil.c.